Travel at 60 blogger Garry shares the story of how he met his friend Leo, a 92-year-old expat living in Thailand. My friendship with Leo Ellis of Chiang Mai, Thailand, began a few years ago. It was a hot April afternoon. 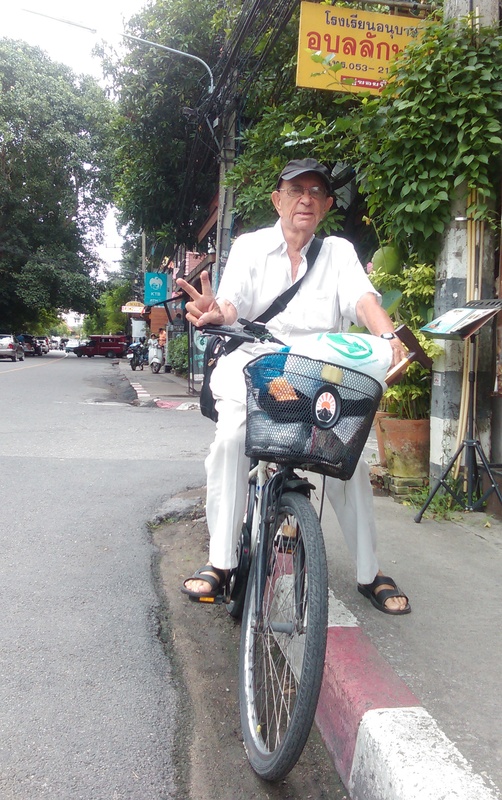 I was alone and sheltering from the heat in a small well-air-conditioned restaurant in Chiang Mai’s old town when I noticed an elderly gentleman dismount his bicycle and enter. I invited him to join me and he graciously accepted. Wiping the sweat from his forehead he introduced himself and we began chatting. I was curious to know why an elderly foreigner was out cycling alone on such a hot afternoon. “I love to be out and about as there are so many interesting places to visit,” Leo explained. Leo must have noticed my look of growing curiosity and concern. “I’m 92, so I guess I need to slow down a bit nowadays,” he said. I was amazed. Leo’s demeanour gave me the impression he was in his early 70s – the way he walked, talked and looked. As our conversation progressed he began to happily divulge more about himself including his reason for being in Thailand. Firstly, Leo is no tourist – he lives here. He migrated from Vancouver in Canada at age 88 alone, seeking an even better life. “I’ve worked and travelled in many countries – England, South Africa, Australia, Central America and several Asian countries. My favourite is Japan, but it’s too expensive for me. I holidayed here in Thailand for six months testing it out to see if I might like to stay here,” he explained. As we sipped our cold drinks under the cold air of the air-con, I learnt how Leo’s aged pension’s purchasing power has increased four or five fold, which means he is able to rent a very comfortable apartment in the charming old town section of Chiang Mai. He eats out whenever he wants, including regularly at high-end restaurants. He also travels, yes, at 92, to neighbouring Asian countries for holidays. He stopped counting the many times he’s visited Japan. He admits that in the last few years he has ceased returning to Canada; instead he encourages family and friends to visit him – and they do. He’s either planning for their visits or entertaining them. They stay in nearby guesthouses or hotels, inexpensive by Canadian standards. Observing Leo more closely my mind was beginning to wonder if he had wittingly or unwittingly stumbled upon that elusive ‘elixir of life’ so many dream of. Is his youthful attitude and demeanour attributable to his strong sense of place and meaning within his new-found community; one that generously bestows rightful respect? Surely this must be a contributing factor to his healthy longevity. Putting ‘life elixirs’ aside, Leo further explains how he’s only had one major brush with the medical profession since being here. That was when he had a kidney stone. After an MRI scan, some CAT scans, X-rays and seven consultations with specialists, his total bill was around AU$700, which he paid out of his own private health insurance fund – of which he is the sole member, contributor and benefactor. “It pays me to take good care of my health,” he said. “What other advantages of living here would you like to share?” I asked. “I think many people have negative or misleading ideas of Asia, but perhaps they’re focussing too much on the wrong things,” he said. “Most places in Asia have excellent, inexpensive public transport. This means I don’t need to own a car. The internet is usually much faster with Wi-Fi access just about everywhere. “New airlines and modern airports are opening up everywhere, too. I find most people here are less stressed. “What about your future? You’re 92; we all have to expect that one day we won’t be able to care for ourselves properly. What will you do?” I asked. “I’ve already planned for that. I’ve found two local retirement homes with beautiful gardens, one on 100 acres of woodlands with walking paths and a stream,” he said. Ever since our first chance encounter on that hot April afternoon, Leo and I have met for breakfast and coffees a few times a week when he’s available, and when I’m in town, whereupon we would share our tales of travel all the while, unknowingly perhaps, fine tuning our very own ‘life elixirs’. I’m now continuing on with my travels firmly of the belief that if possible, life is not meant to be lived in just one place.